When I was a kid I really wanted to be a marine biologist. In particular, I wanted to work at Sea World. For some reason, however, I moved on from that dream and onto several others, including jockey and a children’s defense attorney. So when I first received Friday’s Harbor by Diane Hammond, I was really excited. Of course, I also had the impeccable timing of watching Blackfish, the documentary about the horrors of killer whales in captivity, two days before I started reading it. 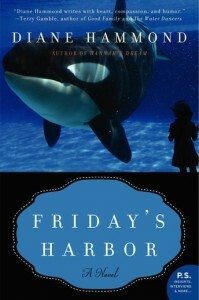 You see, Friday’s Harbor is about a dying killer whale that is brought to the States in order to be rehabilitated. Even so, I loved this book. You see, Friday has spent the last 18 years of his less than 19 years of life in captivity in Colombia. Alone. In a poorly filtered tank that was too small. He was also regularly beat up by the various animals (such as dolphins) plunked into his tank and was a forced to perform for fans despite being 2 tons underweight. He was covered in a scaly infection and was essentially knocking on death’s door. Me during my marine biologist days. So when a rich old woman sets her sights on rescuing Friday, she has both the political clout and the financial means to make it happen. And she does. Friday is quickly transferred to Biedelman Zoo, where a team of animal lovers come together to rehabilitate Friday. Of course, bringing a killer whale into captivity, regardless of whether or not he was already in captivity and being mistreated, is politically risky. Naturally, controversy abounds and a national media frenzy ensues. While a lot of the book is about the animal activists and the everyday goings on of operating a zoo, it also adds in an element of human relationships that I hadn’t expected. The characters are just eccentric enough to be endearing and the author does a great job of humanizing their desire to rehabilitate Friday. It also raises a lot of questions that were raised in Blackfish, but reading it from the point of view of the people with the good intentions gives it a different perspective. Former Sea World trainers have said that, in hindsight, what they were doing was horrible and that at the time they thought they were making a difference. It makes me wonder – do the current trainers feel the same way? And if an animal spends his life in captivity, alone, then would it be humane to release it into the wild to certain death? Or would it be best to keep it in captivity and give it the best life possible? I don’t know the answers to these questions because I’m not a marine biologist (or a zoologist, for that matter), but I can’t imagine that any animal would be able to survive such a drastic change in their circumstances. But the fact that I’m thinking about them demonstrates the powerful topic that Hammond chose for her book and her ability to write such a convincing perspective. If you’re an animal lover, then I highly recommend this book. It will play to your emotions and leave you wanting to cheer some characters and yell at others. For me, that’s a good sign.